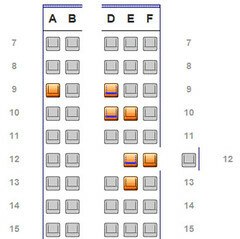 This topic suggestion, Do you prefer the aisle or window when travelling? Why?, is from The Daily Post as part of the Post-a-day writing challenge. I apologise for the bad pun in the title, but I couldn’t resist. I can’t say I’ve travelled much in a plane, however, my experience has told me that I don’t really mind where I sit, aisle or window. However it does depend on the flight. There’s something nice about being able to look out the window as you’re flying into somewhere new. Being able to look out and view this city that you’re going to spend the next little while exploring. Likewise, looking out over your home city as you return, seeing the suburbs, the landmarks that make you love the place where you live and call it your home. However, if the flight is a long one – such as 5 hours or more – I might be willing to pass that up for the possibility of walking around. 5 hours is a long time, and if the person next to me falls asleep, and I need to get out, I don’t want to wake them or climb over them – hence the aisle is better for the longer flights. Overall though, I don’t mind too much. You can see through a window for landing where ever you sit, and the rest of the time I generally spend reading or playing on my laptop, so I’m not fussed over where I sit. I got the window seat on a 20-hour flight, and the guy beside me didn’t pee until the 19th hour. That was tough. Otherwise, I’ve never had any preference whatsoever.